When there is only minor recession, some healthy gingiva (more resilient gum) often remains and protects the tooth, so that no treatment other than modifying home care practices is necessary. However, when recession reaches the mucosa (less resilient gum), the first line of defense against bacterial penetration is lost. In addition, gum recession often results in root sensitivity to hot and cold temperatures, as well as a compromise of your smile. 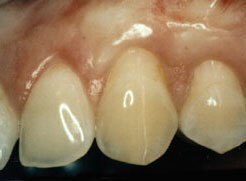 Gum recession can predispose to worsening recession, exposing more root surface. 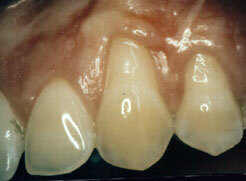 The dentin surface of the root is softer and more susceptible to root decay and abrasion than enamel. A soft tissue graft is designed to solve these problems. The donor graft tissue can be obtained from other areas of the oral cavity (autografts), other humans (allografts) or other animal species (xenografts). Whatever the source, the graft tissue is secured over the exposed root surface to provide a stable and more resilient band of attached gum around the tooth. Treatment objectives include root coverage and establishment of a stable, healthy resilient band of attached tissue around the tooth.